Back in the ‘70s and ‘80s, it was common to see comic-book advertisements that showed superheroes doing goofy things, like laughing uproariously while enjoying a fruit pie with a 25-year shelf life. Can you imagine being the poor schmuck in marketing who had to come up with a Batman plot that pimped sponge cake? There's got to be more than chocolate in those things. 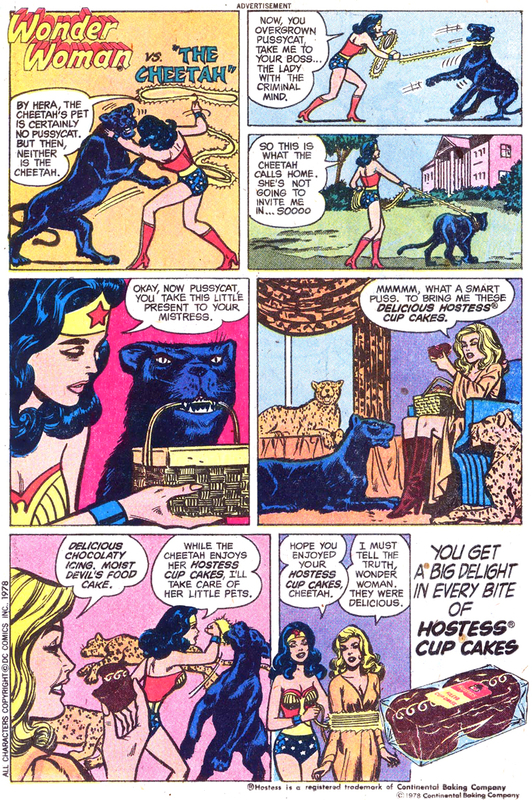 So, though she possesses Athena’s wisdom, Diana figures the best way to get into the Cheetah’s lair is to send a basket full of Delicious Hostess® Cup Cakes. And Cheetah’s too distracted by the chocolaty icing and devil’s food cake (or too stoned) to mind that Wonder Woman is dropping her killer kitties left and right. High on sugar and preservatives, she seems perfectly happy to let Diana take her away to the big house. You’d think these two bitter enemies had just had tea and Waldorf salad at the Themyscira Country Club. Hilarious. I was recently reading an old New Mutants issue from the early 80’s and was reminded of these funny old ads. At least in the Bronze Age Hostess and DC had female superheros such as Wonder Woman and Batgirl in the ads. Today only male superheros are used in joint-activities. The new Chucks that are out … Batman, Hal Jordan, and Supes. Can I get some Batgirl, Black Canary, or Wonder Woman Chucks … please and thank you. I have a box of Hostess Flash Cakes to my immediate right as I type this. Brian, that is just wrong on so many levels! If eating tasty preservative-filled chocolate cupcakes colored like the Flash’s costume is wrong, then I don’t want to be right.